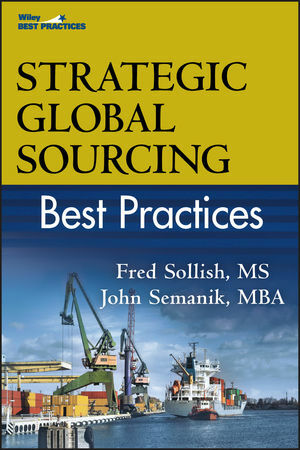 Strategic Global Sourcing Best Practices covers the latest trends and leading edge processes in global strategic sourcing, including supply management, t, sustainability, financial decisions, risk management, and international strategies. With the rise of global supply chains, environmental/sustainability concerns, and constantly evolving technology, the time is right for understanding Strategic Global Sourcing Best Practices. FRED SOLLISH, MS, is the Managing Director of eParagon, LLC, a consulting firm specializing in providing training and working tools for the supply management profession. Fred is former president and CEO of the Institute for Supply Management (ISM) Silicon Valley affiliate and is a longtime member of its Board of Directors. He is also an instructor for sourcing, supply management, and purchasing related courses. His online strategic sourcing program can be found at supplyknowledge.coggno.com. JOHN SEMANIK, MBA, is cofounder and Director of eParagon, LLC. He has served in senior corporate supply chain management positions at such leading-edge companies as Hewlett-Packard Company, Sun Microsystems (acquired by Oracle), and Xilinx, Inc. John was founder, managing director, and instructor for San Jose State University's Professional Development curriculum in supply chain management and purchasing. He serves on the Board of Directors of the Institute for Supply Management (ISM) Silicon Valley affiliate.